How to add previously registered clients to your trip? Learn how to import customers who have already signed up elsewhere. Do you have participants who have already paid you outside of WeTravel and you'd like to add them to your trip for trip management purposes? 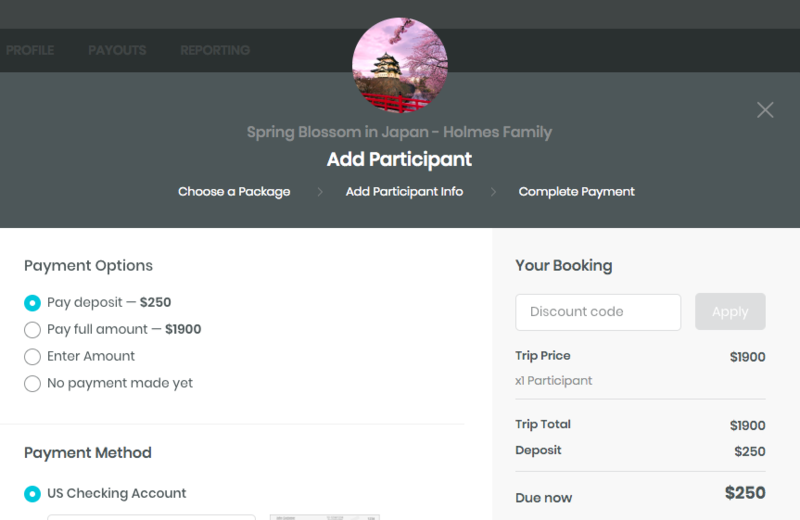 Use the "Add Participant" function to add clients manually to your trip dashboard. You only need your client's name and email to add them to your trip. To start, please go to your trip dashboard and choose "Add Participant"
You can now add participants. Choose the number of people in the booking. You can now enter the participant's name, email, and fill in the participant questionnaire (no worries, your client can always log in to their WeTravel account and make changes to the questionnaire). Click on "Continue to Payment" once ready with filling in the information. Deposit + the rest -- this allows you to record the deposit first. Client's balance due will be the remaining amount. Option to use payment plan. Full amount -- this allows you to record the full price of the trip. Client's balance will be fully paid. Enter Amount -- this allows you to record a custom amount being paid at your discretion. You can see the amount entered as "Due Now" on the right side of the payment window. Client's balance due will be trip price less amount entered. No payment made yet -- this allows you to sign up a participant without any payments upfront. Client's balance due will be the full trip price. You can now choose the payment method. There are 3 options, please choose the Cash or Check option. If you're interested in collecting a payment from the client while registering them, please check out this article. You can use the "Cash or Check" option to record any other previously made payment, be it cash, a wire transfer, PayPal or Venmo payment, etc. Using the "Cash or Check" option, there is no transaction fee applied. You can choose if you'd like your client receiving a booking confirmation email by checking the box. We highly recommend to use the note field to indicate what the previous payment was (e.g. "PayPal received on July 8") so you and your client will know what this payment refers to. Click on "Confirm Booking" and you have signed up your client! You will see the following message: "Participant successfully added". How can my client access their booking? They can easily access their booking by signing in to WeTravel with the email address you signed them up with. If they're having trouble with logging in please feel free to refer them to info@wetravel.com for troubleshooting. What are the fees using Add Participant function? Can I change the participant questionnaire information after I've confirmed the booking? No. Your client will have to do it themselves by logging in and modifying their booking: here's how. I've set up a payment plan for other clients. I just added a new client manually, will the payment plan be automatically applied? If your pricing package has a payment plan already set up then it will be automatically applied. If not, you can always add one from the trip dashboard. Here's how. How is the payment plan affected if I sign a client up with a custom amount? I've added multiple participants at once. Will they all get booking confirmations? Only the person who is added in "Buyer Information" will get a confirmation email. It's more advisable to add participants one by one, if you want all of them to get a confirmation email. I'm adding multiple participants at once. Can they pay with different payment methods? They can only pay with different payment methods if you add them one by one. 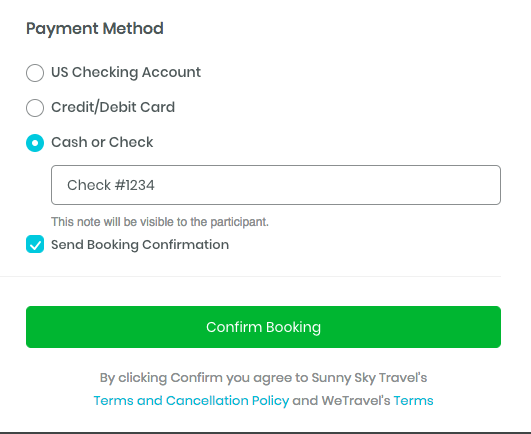 People in the same booking have to be paying using the same payment method. 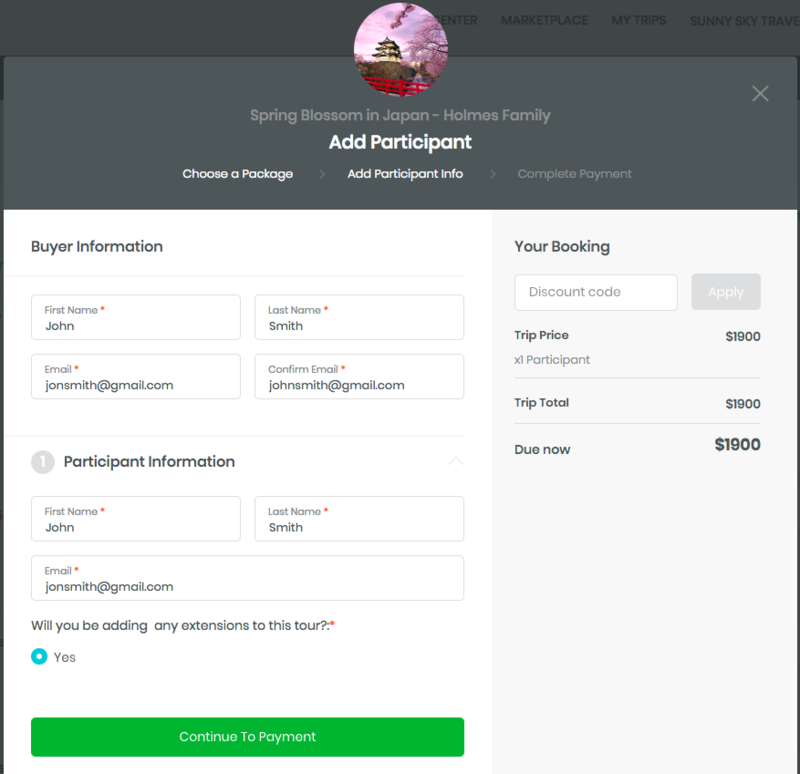 Can I manually add participants after the pricing package deadline has passed? No, please adjust the pricing package deadline first. 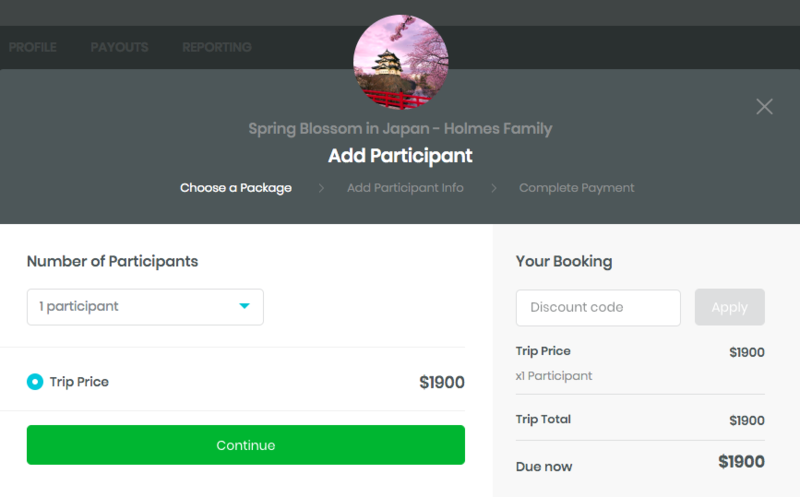 Can I manually add participants if I've reached the maximum number of trip participants or reached the availability of the pricing package? No, please adjust the trip availability first. Here's how.